Opiates – opium and codeine derivatives. Results are then forwarded to the DER by email, fax or regular mail. In all cases of positive tests, the DER is immediately notified by phone. The Department of Transportation (DOT) and the FMCSA has regulations (Title 49, Part 382, click button below) covering drug and alcohol testing of driver's and safety sensitive individuals. Alcohol testing is ordered by a company for purposes of fulfilling the requirements for Random testing, Reasonable Suspicion and/or Post-accident and Return to Work. The test is performed by a DOT level Certified Breath Alcohol Technician. 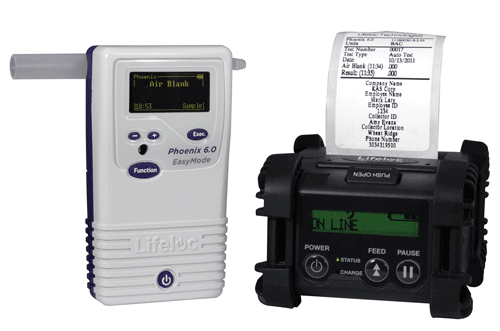 The LifeLoc Phoenix 6.0 BT breath alcohol test equipment is used because of the sensitivity, accurate results and credibility. The results are printed on special tamper proof labels (3) which are self adhering to the Custody Control Forms. Positive tests are reported immediately to the acting DER. The Department of Transportation (DOT) and the FMCSA has regulations (Title 49, Part 382, click button below) covering drug and alcohol testing of driver's and safety sensitive employees.